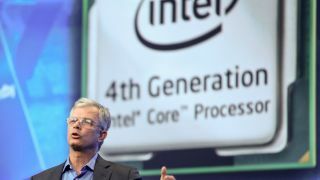 Updated: In a separate statement to TechRadar, an Intel spokesperson noted that Intel will maintain its server motherboard and server systems (integrated board, chassis, and accessories) business through its Enterprise Platforms and Services Division. It's no secret that desktop computers are on the decline, which makes chipmaker Intel's plans to remove desktop motherboards from its product mix not entirely surprising. AnandTech reported Wednesday that Intel is planning to wind down its desktop motherboard division following the launch of its Haswell-based architecture in 2013. "We disclosed internally that Intel's Desktop Motherboard Business will begin slowly ramping down over the course of the next three years," Intel confirmed in a statement to TechRadar. "As Intel gradually ramps down its motherboard business we are ramping up critical areas of the desktop space including integration of innovative solutions for the PC ecosystem." Intel will continue offering desktop chipsets and Form Factor Reference Designs (FFRDs) for third-party motherboard suppliers such as ASUS, Gigabyte, MIS and others. "The desktop segment continues to be a major focus for Intel with hundreds of products across many subsegments and applications," Intel's statement continued. With upwards of 20 years experience in the business, most existing desktop motherboard FFRD talent are expected to remain in place. The complete wind down will take three years to complete, but customers will continue to be supported with a full warranty during that time, which includes upcoming Haswell-based motherboards. Intel plans to shift its focus to FFRDs for Ultrabooks and tablets, with an unknown number of desktop employees being "redistributed" to work on the new form factors. The report also cited less current need for Intel's own motherboards, given the higher quality of third-party product from Taiwan that did not exist in the past. Intel declined to comment on how the shift might impact revenue or sales numbers. Desktop motherboards are considered a low margin product compared to the company's profit making chipsets, so the change is expected to be good news for investors, though not so good news for those who liked using the mobos to build their own PCs.